On this Game Chat episode, Kacy Tiller (Actress) and Scott Clark (The Gaming Outsider) join me to nerd out on some fun and not so fun games. I.E. Far Cry New Dawn, Nier Automata, Metro Exodus, Trials Rising, Spyro Remaster, Treasure Stack, Hellblade, The Evil Within and MORE. ENJOY! Producer Kristina Flores from The Gaming Outsider stops by to talk about a handful of random topics. We talk video games, jogging, sound production and much much more. ENJOY! My friend Roel Santos joins me this week to catch up and talk running marathons, 80s-90s movies, Blockbuster Video, podcasting and more random stuff, ENJOY! Welcome to Game Chat volume 2! Alyssa White joins me to nerd out on some video games. Game, games, games..
Scott Clark (The Gaming Outsider), Alyssa White (Alycat Geekery) and I review a new game called "The gardens Between" and interview Executive Producer/ Level Designer: Simon Joslin. New game chat episode. This week, Alyssa and I are talking video games, games, video games and more games. This week Alyssa WHite and I are reviewing the latest in the Tomb Raider game franchise, Shadow of the Tomb Raider. Amanda Sink from The Hollywood Outsider/ SMIRK podcast, Alyssa White from Alycat Geekery join me to talk about movies, women's nutritional bars, tv shows, and many other random topics, ENJOY! Scott Clark and I, do a review for Yoku's Island Express. Yoku’s Island Express is the debut game from Stockholm based, independent developer Villa Gorilla, which is comprised of just 3 people and headed up by veterans Jens Andersson (Starbreeze, LucasArts, Collecting Smiles) and Mattias Snygg (Starbreeze). Both have a solid AAA pedigree, and have previously worked on The Darkness, Chronicles of Riddick, Syndicate and Colors! 3D. Yoku’s Island Express is out now on Xbox One, PlayStation 4, Nintendo Switch™ and PC for just £15.99 / 19,99 € / $19.99. Hannah Telle drops by for a super fun podcast. We talk about her return as Max in Life is Strange Before the Storm. The Farewell episode comes out this week (March 6th). Scott Clark from The Hollywood Outsider and The Gaming Outsider podcasts, drops by and tells us some pretty funny stories. Hannah sings a few songs for us, and Alyssa White drops by for a few minutes to say hi!We answered a few questions from the Horrible Gamers facebook group. Shout out to John Jerome and Jefferey Rittenour for the comments/questions! Alyssa White visits California. We hung out and reorded a podcast! Absolute blast hanging out with Rae Gray this week. You might know Rae as Gretchen Trimbol on "Fear the Walking Dead" season 3, Jade in the Amazon pilot show "Sea Oak", along side Jane Levy and Glenn Close, and apperances on shows like Shameless, Adventure Time, Chicago Fire, Boardwalk Empire, and Grace and Frankie. Hang out episode this week w/friends Katy Bentz and Alyssa White. No agenda or format, we're just kicking it! This week I have Robert Smith on the podcast. Robert is a entertainer with a very cool and unique gig. Enjoy! Dr. David Perrodin is on the podcast this week. This guy has some really interesting things to talk about. He is a "Expert Witness" in all 50 states. Also the podcast host of The Safety Doc podcast. ENJOY! back in 2018 with youtuber, vlogger, reviewer, gamer, friend Alyssa White. THIS IS TECHNICALLY A FearCast episode. Please support Fearcast by following Shawn Fear Innes and listening to his show also. This week I'm chatting with video game reviewer Jeremy Penter from ACG. We're talking video games, podcasting, more video games, and video game consoles. Total gamer nerd fest this week. Enjoy! Happy Thanksgiving everyone! Alison Harris joins me this week. Always a fun time, especially when things get goofy! Hanging with Jay Bird aka Crazy Jay this week. Jay runs Radio Vegas Rocks. We talk about Las Vegas, Walking Dead, highschool bullies and life! Happy Thanksgiving EVERYONE! This week I hang out with Cynda. She is a gamer, inspiring actress and new friend. Also I play 2 new songs off my friend Vivienne Wilder's (Sam from Slammerkin) new album 'Waking up the Dinosuars'. Those songs are "Boozehounds" and "Anaesthesia"
Zyme stops by to talk about his new album Nuclear Winter (out now!) We play 3 new tracks "Loser" * "Remarkable" and "Bring It Back"
This week I talk to actor/voiceover/podcaster Kiff HandenHeuvel. Kiff has done everything from La La Land, This is Us, Family Guy, Batman vs Superman to Bioshock Infinite and Jimmie kimmel Live! Please check out Kiff's podcast as well "All Over VOiceover"
This week we talk videogames and a ton of radom shiznit. 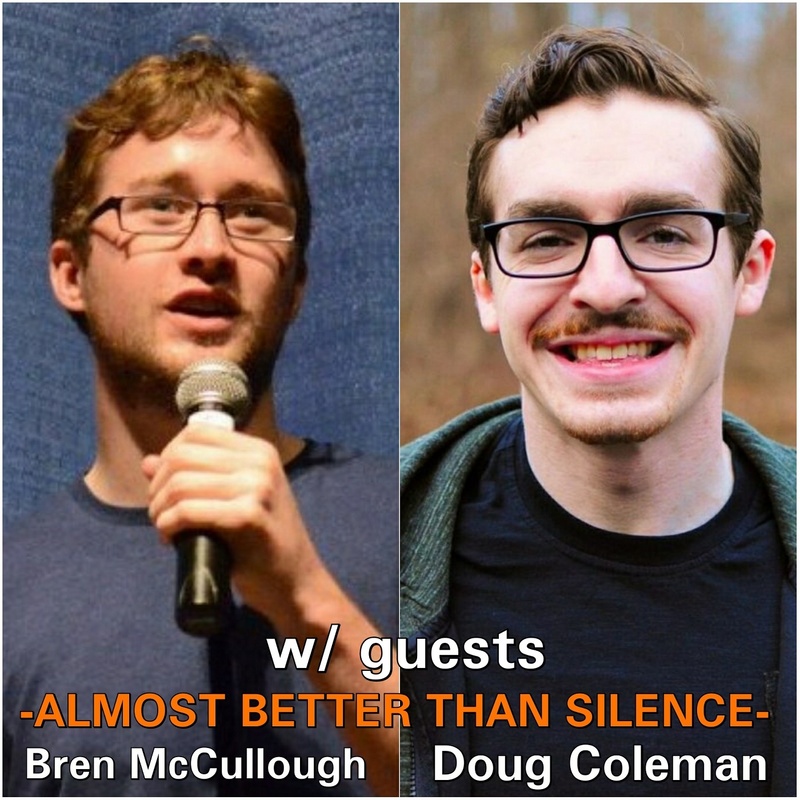 Doug and Bren join me from the Almost Better Than Silence podcast.